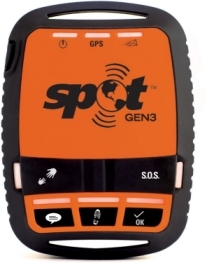 A SPOT Satellite GPS Messenger is specifically designed for remote area communcations and works in conjunction with a satellite communication system, for which an annual subscription (currently US$110 pa) is required. SOS: For a life threatening or other critical emergency. Notifies emergency services of your GPS location and that you need assistance. It is equivalent to activating a Personal Locator Beacon (when there is a threat of grave or imminent danger). Help: For a non-life threatening emergency, this function is used to notify your personal contacts that you need assistance using a preset message. Check-in/OK: Let your friends and family know via email or SMS that all is OK with a pre-programmed message along with your GPS location. Messages are sent via email or SMS to up to 10 pre-determined contacts and your waypoint is stored in your SPOT account for later reference. Custom Message: Allows you to let your friends and family now receive a custom message along with your GPS location with a push of a button. Track Progress: Sends and saves your location and allow contacts to track your progress in near real time using Google Maps. This feature requires an additional subscription fee to the annual subscription. There is also a new SPOT Connect device. It functions as a SPOT but connects via Bluetooth to a smart phone. The user can type and send a message up to 41 characters or send a pre defined message. This allows you to send status updates via social media websites such as Twitter and Facebook. Note: The downside of this device is that if your phone battery goes flat the only feature you can use is the SOS. Lithium AAA batteries, which should last for 14 days when auto-tracking. Water resistant, floats and shock resistant. Police Search and Rescue issue Bush Search and Rescue teams with SPOTS to monitor their progress on search tasks.